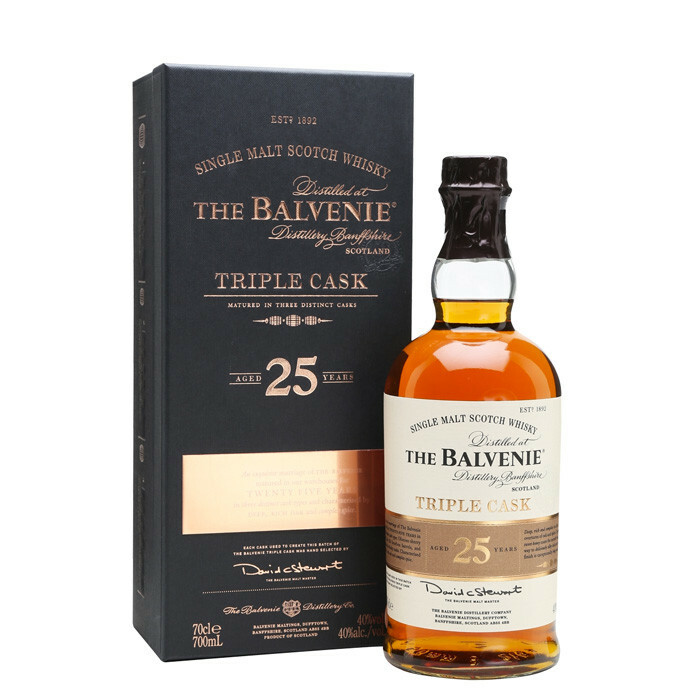 At the top of the Balvenie Triple Cask range sits the 25 Year Old. This incredible expression contains whiskies aged in traditional refill casks, first-fill ex-bourbon barrels and first-fill Oloroso Sherry butts, which have been matured for at least 25 years and allowed to marry for around six months in a marrying tun before being bottled. Astonishing stuff from the renowned Speyside distillers. This was originally released as a Travel Retail exclusive. Nose: Honeyed malt, flamed orange peel, cinnamon, tobacco leaf, papaya and dried fruit. Palate: Thick and spicy with vanilla custard, mixed peels, dates, thyme honey, orchard fruit and cocoa on the tail.